In today’s financial climate, prospective entrepreneurs must be prepared to create a solid business plan if they expect to obtain business start-up funding. But with lenders expecting more and more concise business planning before they are willing to open up their pockets, it is becoming increasingly difficult for would-be entrepreneurs to draft a plan that lenders will accept. 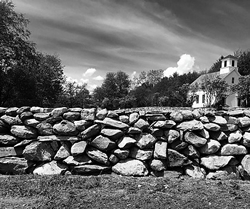 Luke Bonang, owner of the recently established LB Stonework and Landscaping LLC in Weston, Vermont, learned that fact as he sought to turn his passion for stone construction into a viable business. While Bonang is an expert in high quality stonework construction, he knew he needed assistance navigating the complicated landscape of business start-up financing. That’s why he contacted Vermont Small Business Center (VtSBDC) Area Advisor Brian DeClue. He said he was motivated to start his business after noticing a niche market for “dry stone construction of hardscapes, including walls, terraces, walkways, landscape design and landscaping needs.” “I sought help from Brian DeClue to assist me with my business plan and, specifically, the financials of the plan in order to seek a small loan from the bank for my start-up business,” Bonang said. Bonang and DeClue immediately went to work establishing a complete business plan and financial projections, among other things. “There have been many challenges,” Bonang said. “Although these challenges are ongoing, it has been an amazing process thus far, and I hope to continue to learn and grow as a business owner every day.” Bonang added that he has already noticed his business improving. “I have seen results from my experience with Brian (DeClue) and VtSBDC, most specifically on the accounting end and properly writing a sound business plan,” Bonang said. “Brian (DeClue) did an excellent job in explaining a somewhat foreign language to me, and he really helped me understand forecasting financial projections and balance sheets. Brian DeClue is an excellent asset to the VtSBDC, and I look forward to utilizing his assistance in the future,” Bonang said. For more information on LB Stonework and Landscaping LLC, check out www.lbstonework.com. And for more information on VtSBDC, check out www.vtsbdc.org.